Everyone desires that their office space look as appealing as possible. The amount of money budgeted for artwork can vary greatly. High end Class A buildings in exclusive areas may budget hundreds of thousands or even millions of dollars for art. A business just getting started in a Class C building may only have a few hundred dollars to budget for artwork. Abstract paintings are affordable compared to other styles of art. 99.9% of people can’t tell the difference between a quality original abstract painting that costs $850.00 from an original abstract painting from a high-end gallery that costs $10,000.00. Don’t spend more money than needed. Chances are nobody will know. For example, Peachtree Offices in Atlanta has been utilizing original abstract paintings from Julie Gudger in Atlanta for almost 20 years. 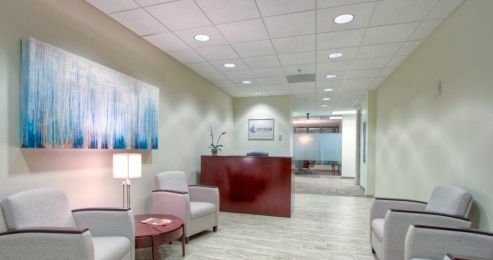 Peachtree Offices has a combination of Class A & Class B office space. With over 300 offices in Atlanta to furnish, the ability to purchase original abstract art affordably is critical. Gallery wrapped abstract paintings don’t need a frame – Finding a painting that you both like and that compliments your office space is enough of a task. Gallery wrapped abstract paintings on high quality canvases will last a lifetime & don’t need a frame. Abstract paintings add color and balance to the space – Abstract paintings are available in every color combination imaginable. Finding a painting that compliments your space is easy. Everyone has a different opinion on artwork. However, the right abstract painting will add just the right amount of color to the space. The painting may not be every single person’s favorite but everyone will appreciate the color and balance it adds to the space. Abstract paintings set the mood for the space – Hopefully you want everyone that works in or visits your office space to be in the best mood possible. If you choose artwork that people don’t like they can’t help but be distracted by it. By utilizing abstract paintings, you are primarily adding color to the space. Most people may have no opinion about the painting at all. If the right abstract painting is chosen for the space they will simply appreciate the color it adds to the room. Abstract paintings tie the space and the furnishings together. Some art styles must be viewed up close to be appreciated. Abstract paintings are about adding color & can be appreciated from a distance. As such, abstract paintings tie the space and the furnishings together from all areas of the space.